1920 (1st January) Françoise Marie Jacqueline Wauters born in Bressoux near Liège, Belgium, the youngest of six children. 1924 The Wauters family moved from Liège to Brussels. 1925 Françoise started primary school at 5½ – a year early – at a Sacré Coeur girls’ school in Rue de Linhout, Brussels. 1930 (June) Sent for a year to Gai Matin, an open-air school at Chesières in Switzerland, to be cured for decalcification of the teeth. 1931 Returned to the Sacré Coeur school in Brussels. In 1934 for two terms before leaving the school Françoise became a boarder at her own request – for no remembered reason – although it was across the street from the family house in Boulevard Brand Whitlock. 1935 Sent to a Sacré Coeur school at Blumenthal on Dutch-German border, mainly to learn German. Françoise was in a special class of six foreign pupils and “painted a lot” (her words). Naturally left-handed, she was made to write with her right hand (the custom of the time) but always painted and drew with her left. 1937 Began study at the Académie Royale des Beaux-Arts in Brussels. 1938 Won the first prize for drawing at the Académie Royale. 1939 Won the first prize for drawing at the Académie Royale. 1940 Won the first prize for drawing at the Académie Royale. Her brother Jacques Wauters was taken prisoner for nine months by the Germans (reason unknown). Françoise Wauters1941 Left the Académie Royale having won only the fourth prize for drawing in that year due to her increasing tendency to elongate and distort the figures in her drawings (a characteristic she retained throughout her artistic life). She had received an excellent grounding in drawing but felt there was “nothing at the Académie Royale to stimulate the imagination”. Began six-year studies at ‘La Cambre’ – the Ecole Nationale Supérieure d’Architecture et d’Arts Decoratifs in Brussels – specialising in engraving, book illustration and typography. Her tutor was Joris Minne, an important Belgian engraver and book illustrator. Françoise had intended to study sculpture but was persuaded to study book illustration by her father, himself an art lover who admired Turner, the Pre-Raphaelites, Art Nouveau and Ruskin. 1944 Produced her first of many engravings at La Cambre. Also drawing in pen-and-ink with or without painted wash and producing monoprints and woodcuts illustrating stories and fables from a wide range of European literature: Emily Brontë (Wuthering Heights), Alain-Fournier (Le Grand Meaulnes), Filip De Pillecyn, Kafka, Conrad, Homer (The Odyssey), Hans Christian Andersen and others. Also scenes from the Bible. Produced a series of drawings Chemin de Croix – the Stations of the Cross. At this time Françoise was deeply religious; she remained a devout Catholic for most of her life. 1945 Became a part-time art teacher at St Joseph’s girls’ school in Antwerp. Also preparing work to submit to a jury to receive a Bourse and enter a Mastery in Book Illustration at La Cambre, for which she was the first in Belgium to be accepted. Produced a series of engravings titled La Guerre depicting life in Belgium during the German occupation and recording the terrors of the Deportations and the allied bombardment. Françoise never spoke to any Germans during the war, nor did she ever have any contact with them except through her mother working for the Red Cross. Met Englishman Kenneth Taylor at the home of Joris Minne in Antwerp. Kenneth had been Signals Officer in the 6th Battalion of Green Howards, part of the Allied Expeditionary Force which landed in Normandy on D-Day and reached Belgium then Nijmegen in Holland by September 1944. In 1945 after seeing action in the Reichwald with the 3rd East Lancs he was assigned to the Belgian Army as a Liaison Officer. Françoise backed out of their first date, sending her mother instead. 1946 (October) Married Kenneth Taylor in Brussels (to the disgust of her art tutor Joris Minne who for six months refused to look at her drawings). Françoise – now Taylor – was working on her Mastery in Book Illustration which continued in England after she and Kenneth moved to Oxford in November. At this time she did not speak English. During a visit to England (August/September) stayed in High Wycombe at the home of Mrs Eric Gill, wife of the (then deceased) typeface designer and printmaker Eric Gill (reason unknown). 1947 (January) Kenneth began reading PPE at Oxford University. 1948 (February) First son born in Oxford. Moved from Manor Farm, Toot Baldon to Banbury Road, Oxford. 1949 Spent one term at the Ruskin School, Oxford, studying lithography. (April) Moved from Oxford to Barrow Bridge in Bolton, Lancashire. Kenneth started work in the family business in Horwich near Bolton. (October) Presented her portfolio in Brussels to a jury of seven of the main art critics in Belgium and was awarded a Diploma with the Highest Distinction and her Mastery in Book Illustration “avec la plus grande distinction et les félicitations du Jury”. The works illustrated were Le Morte d’Arthur (Sir Thomas Mallory), The Rime of the Ancient Mariner (Samuel Taylor Coleridge), a Baudelaire poem about cats, The Idiot (Dostoievski), The Basement Room (Graham Greene) and Æsop’s Fables. 1950 Continued to produce engravings which were sent to London for printing. These were now less inspired by literature and more by the environment of industrial Bolton. Despite family commitments (her second son was born this year) Françoise wandered about the streets making sketches of the mills, the gasworks, the back streets, the football matches, the railway stations and the people with their animals, which she then translated onto copper plate and, increasingly, ordinary paper through the medium of pen-and-ink with or without wash. Animals are a feature of her pictures throughout her life. 1951 Third son born in Bolton. Her father Charles Wauters died in Belgium. 1953 Involvement in productions by the Little Theatre, Bolton (eg: drawings for Alice in Wonderland and Through the Looking Glass projected by cyclorama, costumes designs for The Hopeful Travellers). Moved from Barrow Bridge, Bolton to Heaton, Bolton. 1954 First daughter born in Bolton. Her mother Jeanne Wauters died in Belgium. 1958 Second daughter born in Bolton. 1962 Began painting in oil following a visit to Greece. 1963 Oil paintings exhibited at the Tib Lane Gallery in Manchester but ultimately Françoise did not enjoy the medium and subsequently burned a number of pictures in her back garden (though some have survived, rescued by one of her sons). Françoise Taylor had no desire to become publicly celebrated as an artist. The exhibitions held during the 1950s and 60s were encouraged by her husband as ‘the thing to do’ and for local people to be able to appreciate the scenes on their walls. Fame and fortune were never a consideration; indeed a number of pictures were done on the reverse side of others or on damaged paper, wet paint carelessly marked with her fingerprints around the edges etc. Françoise had no contact with other artists nor did she take part in the activities of the art establishment, locally or anywhere else. Entirely self-motivated and scathing of artists who sit ‘waiting for inspiration’ she produced some 300 or more ‘Bolton scenes’ (of which a significant number were purchased privately at her various exhibitions). 1967 Began a teacher training course for Art and French at Chorley College. 1969 Completed her teacher training and was appointed Head of Art at Mount St Joseph girls’ school in Bolton. 1982 Retired from teaching art. Continued to draw and paint on-and-off during the 1980s and up to the mid-1990s. Became interested in pottery and ceramics, working in clay in a local pottery class and using her own kiln at home. Themes included Alice in Wonderland and Venice, increasingly characterising deluded reality and sadness (eg: Alice in the Pool of Tears). Produced both pen-and-ink drawings on white paper and small coloured drawings on coloured paper. Despite having experienced no significant personal tragedies, remaining an active hill walker with Kenneth, maintaining a love of classical music and other interests, in her 70s Françoise entered a period of melancholy and disillusionment with religion which tended to influence her final pictures. 1992 Exhibition of paintings of local street scenes at Mere Hall, Bolton as part of the town’s ‘City Challenge’ initiative for Halliwell (pictures produced in the 1950s and 60s). 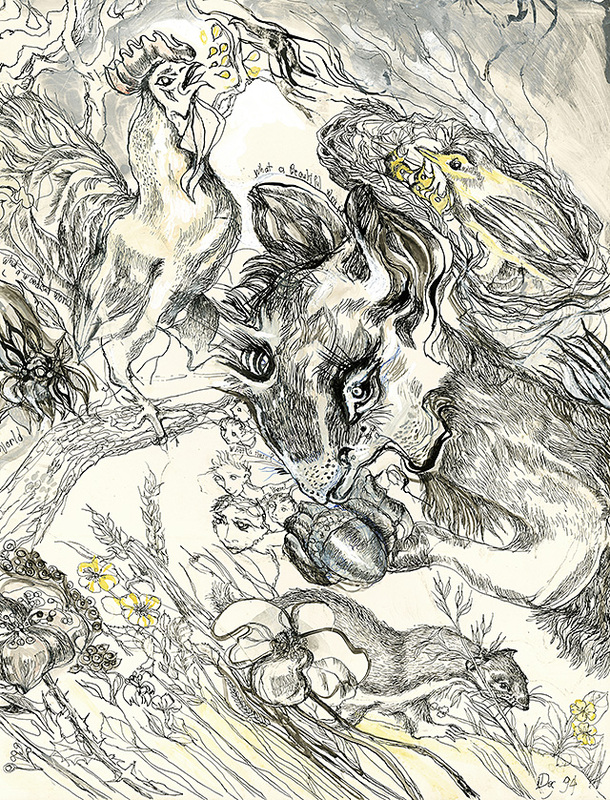 1994 Pen-and-ink drawing ‘What a beautiful world’ in which human children emerge into a harmonious, natural world of animals and plants (one of her last drawings at the age of 74). 2007 Françoise Taylor died from pneumonia at home in Bolton on January 24th aged 87. Kenneth died from similar causes in 2011. One of Françoise’s last drawings at the age of 78. 2013 A number of works were taken into the permanent collection at The Whitworth in Manchester. These include a set of her series of 1945 engravings titled La Guerre.